Calling out to all Meditator's, Yogi's, Sound Healing and Sound Bath Lovers come and be treat your Mind, Body and Soul to a Deep Dreaming Sound Journey led by Vanessa Forbes and Steve Mazabow. 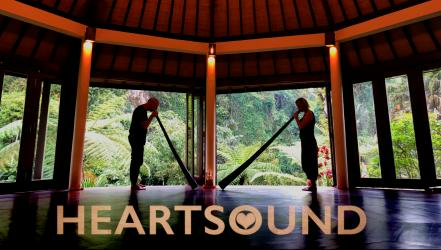 Deep Dream Sound Journey is sound session where participants lie down, relax and allow themselves to go on a deep meditative inner healing journey as Vanessa and Steve play various sacred and mystical instruments, intuitively guided to accommodate the collective frequency and needs of the group. Our main instruments are didgeridoo (made from mystical black hemp), and Mayan Temple love flute, but also magical Turkish Panpipes, African Kalmiba, Hang Drum, Tibetan bowls, Native American Flute and various percussion instruments. Vanessa sings a combination of original songs and devotional mantras, bringing in healing and therapeutic energies. As we begin the journey, hold in your field an intention you want to send more harmony into, and let the sounds guide the way. 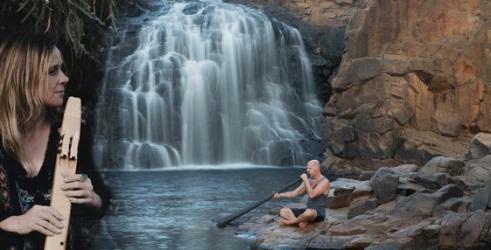 Using the mystical and primordial essences of the Black Hemp Didgeridoos interwoven by the mystical sounds of the Mayan Temple Drone Flute and Sacred Chanting by Vanessa. Steve and Vanessa will take you on a magical sonic sound journey which resonates deeply inside your body, gently moving you into a deep state of relaxation and to tune into the knowledge of the universe around us in a more intuitive way. 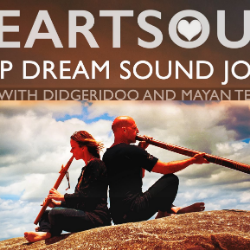 Get to experience Didgipuncture - didgeridoo played around your body which resonates deeply inside your body, releasing emotional blockages which also provides deep inner cellular sonic vibration and massaging. What to Bring: Please bring something soft to lie on and a pillow for your head and maybe a blanket to keep yourself warm and cosy and if you want extra comfort bring additional yoga mat.